The Gallipoli Peninsula runs in a south-westerly direction into the Aegean Seabetween the Hellesport (now known as the Dardanelles) and the bay of Melas, which today is known as Saros Bay. At the time of the First World War, this narrow sea strait was a direct route to the Russian Empire, but was controlled by the Turkish Ottoman Empire, allied to Germany. In an attempt to break the deadlock on the Western Front, the Allies launched an ambitious attack on Gallipoli Peninsular on the 25th April 1915. They hoped that capturing the Dardanelles Straits would help supply Russia, defeat Turkey and encourageGreece and Bulgaria to join the allies in the war. The allies invaded the Gallipoli Peninsular at several beaches. They were met by stiff Turkish resistance, which confined them to narrow beachheads. The Campaign fighting was fierce, attritional and largely static. The first two weeks alone at Gallipoli, saw a higher rate of allied casualties than the Battle of the Somme, when measured as a percentage of those committed. Forced to dig in around the shorelines, the Allies spent the next eight months trying to capture the high ground and break free from the Peninsular. Eventually, the Allies were forced to withdraw from Gallipoli on the 9th January 1916. The eight month Gallipoli Campaign was a famous Turkish victory, costly to both sides. The Allied campaign was plagued by ill-defined goals, poor planning, insufficient artillery, inexperienced troops, inaccurate maps and intelligence, overconfidence, inadequate equipment and logistics, and tactical deficiencies at all levels. Geography also proved a significant factor with the Turks holding the higher ground. The Allies lost some 250,000 men, including 140,000 men through disease. Turkish casualties were estimated to be at least 280,000. Gallipoli is best remembered for forging the National identity of Australia and New Zealand who fought so bravely there, and for the remarkable evacuation of the Peninsular, with the loss of only one life. The Gallipoli campaign has been keenly debated over the last century. Some believe it was a poorly planned exercise that failed in Whitehall, long before any serviceman set foot on the Peninsular. Others argue that the campaign could have been successful, but may have made little difference to the main struggle on the Western Front. We can only speculate. However, history has largely overlooked how close ‘D’ company and 'HQ Battalion' of the 6th East Yorkshire Regiment, came to winning the campaign on the 8th and 9th Aug 1915. They failed (despite claims otherwise). The following is an interesting and little known episode in the Gallipoli story. Tekke Tepe, a hill about 800ft in height, in the centre of a series of ridges disposed, roughly in the shape of a horseshoe and enclosingSuvlaBay. General Sir Ian Hamilton, Commander of the Mediterranean Expeditionary Force, maintained that capturing this hill was crucial to succeed at Gallipoli. 8th Aug 1915. Orders were received to join the 32nd Brigade with the WEST YORKS on our left, to attack and hold a position running from CHOCOLATE HILL to SULAJIK 105 C 6. The records of these orders have been lost. The Battalion advanced B [Coy] on the left under Major, BRAY, D [Coy] on the right under Capt GRANT, C [Coy] in second line and A [Coy] in reserve. LtCol MOORE advanced with the 1st line. At first no opposition was met with but occupying the ridge which joins up with CHOCOLATE HILL and was about W by S from ANAFARTA SAGIR heavy firing was encountered. (Margin: Ref to ANAFARTA SAGIR sheet 1:20,000 Gallipoli Map 105 C 6) Capt ROGERS was killed and shortly afterwards Major, ESTRIDGE was wounded in the arm. The Turks employed numerous snipers and shot particularly at our men as they went for water at a well. Parties were sent out, but were unable to find them. The position was entrenched on the reverse slope during the day and further forward during the night. Two officer's patrols were sent out during the evening: At about11:30 pm orders were received for the Battalion to retire to the points held by the WEST RIDING Regt and to occupy and improve a Turkish trench there. 11:30 pm. The orders have been lost. The men were tired and exhausted and short of water moving often in the dark led to equipment being mislaid. 9th Aug 1915. We found the West Riding Regiment in a vacant Turkish Trench at about 1:30 am. After some confusion getting the men into the trench in the dark, orders (lost) were received at 3:30 a.m. (late in reaching us) to deliver an attack (orders lost) on TEKKE TEPE (Sheet 119 O2). The West Riding Regt was to attack KAVALA TEPE (Sheet 119 C7) on our left. The men were at this stage in a state of extreme exhaustion and hunger. The Battalion moved northwards out of the trench in the following order D, C, B, A after passing SULAJIK, we took a NE route crossing the dry beds of the streams. Verbal orders had been given by Lt Col Moore that in the attack D and B Companies should form the first line (D on the left, B on the right) A Coy (Capt WILLATS) the second line and C Coy (now under Capt PRINGLE) the reserve. LtCol MOORE was with D Coy. The other three companies due to the extreme exhaustion of the men and absence of explicit orders, failed to keep in touch with D Coy, who proceeded to advance up the lower slopes of the hill, without waiting for B Coy to come into position on their right, or for the other two companies to get into place. D Coy with LtCol MOORE and 2 Lt., STILL (Acting Adjutant) and HQ party seemed to have encountered no opposition at first. It was only when they were up the first shoulder (Sheet 119 L4) that the strength of the enemy was disclosed. Fire was poured in from concealed Turkish trenches and our men were unable to hold their ground. There was considerable confusion due to the rapid advance of D Coy and the fact that the other Companies had lost touch. D Coy suffered heavily. Capt GRANT had been wounded in the hand early in the engagement – Lt Col MOORE, 2 Lt STILL, Capt ELLIOTT, Lt RAWSTORNE, 2Lt WILSON were all missing, when what remained of the Coy fell back. A general retirement took place during which there was much mixing of units due to the Battalion failing to keep its formation. After two other stands had been made in conjunction with the West Riding Regt a line was eventually taken up along a line running N from (Sheet 118 V6). Reinforcements came up here and about 13:00 the Battalion was relieved and ordered to concentrate at the cut on A Beach (Sheet 104 B1). All orders and dispatches relating to these are lost as the orderly who carried them is missing……[A long list of Officer casualties follows] Other Ranks: Killed 20, Wounded 104, Wounded and Missing 28, Missing 183.This night the battalion bivouacked on 'A' Beach near the cut." The withdrawal of the East Yorkshires of the night of 8th August was difficult. There was no moon and it was pitch dark. It was almost impossible to find equipment and assemble the battalion quickly to move off to Sulajik. All the time, the Turks continued their fire on theEast Yorkshire, while they moved back and reached the position in the early hours. The East Yorkshire soldiers on arrival at 1.30amdropped with exhaustion. Between 3 and 3.30 am, all Company Commanders were suddenly ordered to report to the Colonel. They were told that the 6th East Yorkshire Regiment had received orders to seize the very high hill above Anafarta (Tekke Tepe). The West Ridings would attack another hill on the left (Kavak Tepe). As the orders had arrived late, the battalion had to move off immediately. The Men in a state of exhaustion, thirsty and hungry, had to be pulled out of their trenches. Lt Colonel, HGA Moore started off with HQ and D companies. When the three remaining companies assembled they found Colonel Moore, their Commanding Officer had gone ahead. In crossing the open space between the trenches at Sulajik and the foot of the hill, little or no opposition was encountered. Two officers of the 67th Field Company Royal Engineers, Major F.W. Brunner and Lt. V.Z. Ferranti accompanied Col. Moore. Lt Ferranti was ordered to wait and follow up with the next company of East Yorkshires that came along. The group split into three parties. Col Moore., Maj. Brunner and Lt Still, with one party, Capt. Steel with another, and Capt. Elliott with the third. As they reached the lower slopes of the hill, north of Baka Baba, the rifle fire from the snipers became more insistent. They carried on up Tekke Tepe, the casualties becoming more serious. Major Brunner was killed and many others shot down. The survivors, Col Moore and Lt Still leading, reached the summit, along with Capt Elliot, Lt Rawstone and between 12 and 30 men. They were cut off by the advancing Turks and the survivors, five in number, including Mr. Still, were captured. This little party of East Yorkshire men and Engineers achieved the brilliant feat of reaching a position, farther east on the heights above SuvlaBay than any other troops in the entire campaign. Of the 750 men in the 6th (Pioneer) East York’s Battalion, 347, or roughly 46% had become casualties in just 3 days. Officer casualties were 15 or 75% of those who landed on 7th August. They included 2 Officers killed in action, 5 wounded, 6 missing in action and 2 'Wounded and Missing'. Most of those 'missing in action' at Gallipoli were actually killed. Searching this website shows that 47 men killed with the 6th East Yorkshires came from Hull, and ten others from Hull, died on the 9th August 1915 at Suvla Bay, fighting for New Zealand, the West Ridings and other regiments. After the War, all captured British Officers were required to make a written statement to the War Office, about the events surrounding their capture. Capt R D Elliott, 6th Battalion East Yorkshire Regiment captured at Tekke Tepe, recounted how they reached the top of hill. Another account by Lieutenant John Still wrote. “About thirty of us reached the top of hill, perhaps a few more. And when there were about twenty left we turned and went down again. We had reached the highest point and furthest point that British forces from Suvla Bay were destined to reach. But we naturally knew nothing of that." General Sir Ian Hamilton, Commander of the Mediterranean Expeditionary Force, wrote in his War Diary, that Tekke Tepe was the key hill, overlooking Suvla Bay. He believed British troops had actually reached the summit of the hill on August 9, and that, had they been given proper support, victory was in sight. However, until 1923 he had no definite evidence to confirm his belief. In October 1923 he received a letter printed in The Times, (on 30th October 1923), from Mr. John Still, a tea planter in Ceylon, who had been adjutant of the 6thBattalion East Yorkshire Regiment, a unit of the 32 Brigade, during the Suvla operations. Mr Still gave details of his own experiences on Tekke Tepe as follows:-. “I was the only officer on that hill who had spent years in jungle and on hills and was in consequence able to appreciate things accurately. We had been ordered to take up that position on the map and we took it up. I fixed our exact position by prismatic compass. We fought all day there and had a good few casualties including two officers (or three), and then we were taken off again at night "because the regiments to right and left of you have not been able to get up". That was the night of August 8. On our right, were a sergeant and two men only of another regiment, lost and re-found by us. I forget their unit, but I can still see the identifying mark on their backs in my mind's eye: it was a sort of castle in yellow. Beyond them there was a gap right away to Chocolate Hill. On our left was not as you state another regiment, but only a weak half company of the West Yorkshires with two officers of whom one was killed, and the other – Davenport– severely wounded. And this left us in the air. Your orders given to General Stopford at 6pm never reached us on Scimitar Hill. Why? They knew where we were, for I was in touch by day with Brigade H.Q. signalers on Hill 10 or close to it. By night I lost contact for both my lamps failed me. As you justly say, anyone with half an eye could see Tekke Tepe was the key to the whole position. Even I, a middle-aged amateur who had done a bit of big game shooting and knocking about saw it at once. We reconnoitered it, sent an officer and my signaler corporal to climb it, and got through to Brigade H.Q. the message giving our results. I sent it myself. The hill was then empty. Next morning you saw or heard that troops had actually reached the top of Tekke Tepe. Yes they had. A worn and weak company, D Company, of my regiment, together with my Colonel (Moore). Major Brunner, of the R.E., and myself started up that hill. About thirty got to the top: of them five got down again to the bottom, and of those, three lived to the end of the war. I was one of them. You wonder why we did not dig in (pages 78 and 79 of your Volume II) as we had lots of time. There, Sir is where that war was lost. You set a Brigade at that empty hill on the afternoon of the 8th. Actually, owing to staff work being so bad, a battalion received orders to attack and did not receive those orders until dawn on the 9th. I received them myself as adjutant. The order ran to this effect: "The C.-in-C. considers this operation essential to the success of the whole campaign". The order was sent out on the late afternoon of the 8th, when we were on Scimitar Hill. It reached us at dawn on the 9thin a Turkish trench at Sulejik. In the meanwhile, for those hours more precious to the world than we even yet can judge, the Brigade Major was lost! Good God why didn't they send a man who knew the country? He was lost, lost, lost and it drives one almost mad to think of it. Excuse Me. Next morning (from the order) at dawn on the 9thyou saw some of our fellows climbing cattle tracks. You don't place them exactly where I think you really saw them, but as I know, there were none just precisely where you say you saw them, I am pretty certain it was us you saw from the ship, only we were half a mile north of where you describe.Then we climbed Tekke Tepe. Simultaneously the Turks attacked through the gap from Anafarta. Their attack cut in behind D Company and held back the rest of the battalion who fought in the trench, with the Duke of Wellington's on their left. We went on, and, as I said, not one of us got back again. A few were taken prisoner. I was slightly wounded, and stayed three years and three months as a prisoner. Later that morning we who survived were again taken up Tekke Tepe by its northern ravine on the west side. Turkish troops were simply pouring down it and the other ravines. On the top of Tekke Tepe were four field guns camouflaged with boughs of scrub oak, and a Brigade H.Q. was just behind the ridge. I had a few minutes conversation there with the Turkish Brigadier in French. But I am coming home on leave in March or April next. May I have the honour of meeting you and going over it on the map? I think much might be cleared up that was still obscure when you wrote your book. There are one or two things one prefers not to write. Please let me know your wishes in this matter. I loved your book and I want to do any small thing possible to complete your picture. Yours truly (Signed) JOHN STILL, Victoria Commemoration Buildings, Nos: 40 and 41 Ward Street, Kandy, Ceylon Sept 19. 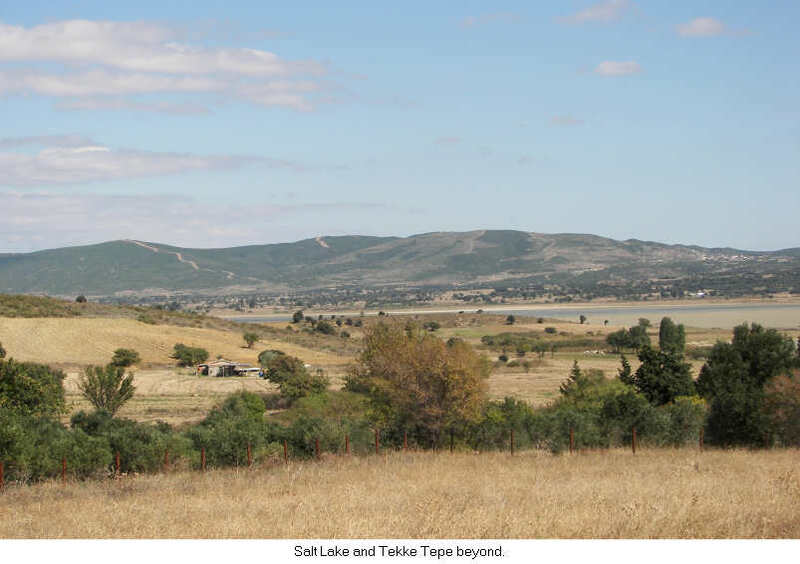 "Being a qualified land surveyor, and experienced in the use and construction of maps and the knowledge of the country, I was well able to keep notes of our positions and was the officer mentioned in your letter who took the patrol up Tekke Tepe. In fact I still have your signal corporal’s field glasses which I took from him while on the hill, my own being smashed by a rifle bullet whilst using them on this patrol. My report disagrees with your letter in a few minor details – for instance while on Scimitar Hill, the 9th West Yorkshires were on our left, as I was actually speaking with their officers on their own right flank, but they were withdrawn before us, God knows why? Again, while you say Tekke Tepe was not occupied, it was held very lightly by patrols. We ran into two of them before reaching the top; out of one we bagged two Turks, the other escaped us. There were also three short lengths of partially dug trenches unoccupied while we were there, but showing signs of most recent occupation. Further, you say that the Turks came in behind D Company and the rest of the battalion fought in the trench. This is not quite right. We had advance fully 1500 yards (and I was with the rear company “B”) before we encountered the Turks. When we did, it was a ‘free for all’ bayonet affair, with the Turks outnumbering us about three to one. I saw nothing of the West Yorkshires as you mention, but the West Ridings who were to have supported the Brigade!!! attack were present. However, my report and your letter agree in the great fundamental point, this, that Tekke Tepe should have been taken on the evening of August 8. That this could and would have been done had there not been a lamentable failure of the Staff, I think goes unquestioned by those of us who had an accurate knowledge of the conditions; it was the loss of the Gallipoli campaign. I am even of the opinion that, that had the Staff work not been so rotten, and that had the attack in the early morning of August 9 been by three battalions instead of us alone, it might have been successful. If you remember, the attack was to have been a brigade affair, three battalions in attack with one in support. The supports (the West Ridings) were there, but where the other two battalions were, God alone knows. I think all of Kitchener’s Army who took part in this landing and the following few days felt it intensely that they were blamed by the Staff for the failure on the grounds of being green troops. Compared with later experiences in France, the 11thand 10thDivision fought as well as any troops ever did, be they Regulars or otherwise, and I am sure that those of us who had the honour to belong to either the 11thor 10thDivisions feel grateful to you for coming out plainly and placing the blame where it so justly belongs." Some modern historians argue that the attack of the 6th East Yorkshire attack on Tekke Tepe (actually in effect only D Coy and Battalion HQ) never reached the summit on the 9th August. They say that the Officers were mistaken when they said they reached the summit or were making allowances for being taken Prisoner. Also as most of the 6th East Yorkshires were killed or captured, all the official reports were compiled after the events, by persons who had not been present. The War diaries show very clearly that patrols sent by the 6th (Pioneer) Battalion East Yorkshire Regiment on the 8th August (the day before) met with little opposition, but a later advance on the 9th August to exploit this opportunity by the 6th (Pioneer) Battalion East Yorkshires, supported by the 8th Battalion Duke of Wellington's Regiment (West Riding) and 67 Coy RE was too late. It was repulsed by Turkish reinforcements with heavy loss to D Coy 6th (Pioneer) Battalion East York’s, who advanced without waiting for the remainder of the Battalion. We can only go by the primary sources of Lt Still and 2nd Lt Underhill, who both were there at the time. They both confirm separately that they occupied Tekke Tepe. John Still was a 35 year old, tea Planter, use to the hills of Ceylon. James Theodore Underhill was a qualified land surveyor. Both would have known if they had reached the top of Tekke Tepe. There was no collusion between them. John Still returned to Ceylon and James Underhill returned to Vancouver after the war. Yet they both agree that the Tekke Tepe hill was taken, and that if it had been held, The Gallipolli Campaign would have succeeded. While we probably require a 3 D image of Suvla to plot the attack on Tekke Tepe, it is perhaps best to concentrate on the bravery of the 6th East Yorkshires, who stormed the hill with, limited support in difficult conditions. These Pioneers were used in (arguably) the most important assault of the campaign. They were bravely led, by Col Moore, (who had risen from the ranks) and were decimated within sight of their ultimate objective. Appalling planning after too much procrastination, no time for orders or battle preparation, a fragmented uncoordinated attack, perhaps over-zealous leadership, tactical naivety, exhaustion and fatigue (men had to be kicked into action from a state of near exhaustion), superhuman effort resulting in failure, then denial and blame. The 6th Battalion who had landed at Gallipoli in the early hours of the 7th Aug with 22 Officers and 750 Other ranks, had within 3 days, lost 15 Officers (2 killed, 5 wounded, 6 missing and 2 'Wounded and Missing' and 347 other ranks. For them Gallipoli was no Side Show. The story of the 6th East Yorkshire at Tekke Tepe is not a particularly well researched or well understood part of the campaign, but it encapsulates everything in one small action that was wrong about the Gallipoli. The following recounts the progress of the 6Th East Yorkshires after the Tekke Tepe attack. Wyrall's "East Yorkshire Regiment in the Great War" shows that the 6th East Yorkshire Regiment had been in reserve from 10th to the 20th August at Nibrunesi Point where they had dug themselves in at the base of a cliff. On 20th August the 6thEast Yorkshires relieved the Northumberland Fusiliers in trenches South East of Chocolate Hill. They came under the orders of 34th Brigade who would attack "Hill W" the next morning.The 6th Battalion were to dig in and support the Lancashire Fusiliers and the Dorset’s, who would attack the next morning. There was a delay due to lost orders and confusion, and the attack did not commence until 3pm on the 21st. When the Dorset’s and Lancashire’s left their trenches the 6th East Yorkshires moved forward to occupy these trenches. The Dorset’s and the Lancashire’s ran into stubborn resistance and so most of the 6th East Yorkshires were sent forward to support them. The 6th East Yorkshire's captured a Turkish trench in front of them and awaited relief. The 6th East York Pioneers) had occupied Hill 70 (Scimitar Hill), next to W Hill the most vital of all the semicircle of heights overlooking SuvlaBay and were there only waiting for the brigade's further advance upon W Hill or Anafarta Sagir, to both of which it is the key.They held this trench overnight but it became impossible to hold the next morning (22nd August) as the number of Turks increased and they had no bombs. Around 7.30 am the 6th East Yorkshires retreated to their original trenches and later that night they were relieved and moved back to their original reserve trenches at Nibrunesi point the following morning. The 6th East Yorkshire casualties by 22nd August 1915 included 26 Officers and 628 men. Officer casualties were (80%) and other ranks 68%. The War Diary for the 6th (Service) Battalion East Yorkshire Regiment (Pioneers) on 20th Oct 1915 is edited below. It was written in very feint pencil and just legible. The Battalion was scattered over a place known to the troops as ‘Piccadilly Circus’ or shrapnel valley due to heavy Turkish shelling. There are no records of battle casualties but the War Diary contains long lists of men admitted to hospital and lists of men who arrived in drafts. Notably most posted to D Coy - a stark reminder that D Coy was virtually wiped out on the lower slopes of Tekke Tepe on 9th August.